The City of Boston has the most firefighters per square mile and spends more per capita on fire and emergency medical services than any other large US city, paying the equivalent of $452 per resident annually, a recent study found. San Francisco pays the second-highest amount, spending $316 per resident. New York ranked 18th, and Los Angeles placed 23d in the survey of public safety spending in the 25 largest cities in the country. The Boston Finance Commission, a city watchdog agency, said the study proves what it has been saying for years: that the Boston Fire Department is exceedingly expensive and bloated. "It's time to get rid of some of the bloat," Executive Director Jeffrey W. Conley said. "Boston taxpayers should not have to pick up that financial burden any longer." The report ranking fire and emergency medical services was conducted earlier this year by budget officials in Columbus who were trying to analyze how that city placed in public safety spending. Word of the report's results has since circulated among municipal research groups across the coun try and was recently picked up by Boston officials. City labor negotiators are now using the results in arbitration negotiations with the Boston firefighters union to bolster their case that extra pay demands from the union are off-base. Edward Kelly, president of the firefighters union, Local 718, refused to comment yesterday on the report's conclusions. "That's just the city's spin," Kelly said. "We have our own analysis to offer and I'm not going to do it in the newspaper." 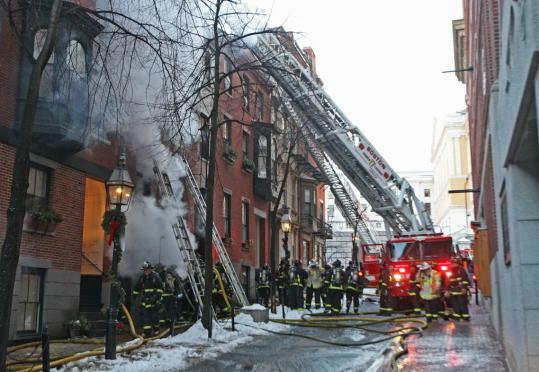 In the past, the union has defended the high number of firefighters, saying Boston's older buildings and narrow, twisty roads require more personnel for fire suppression. Samuel L. Tyler, president of the Boston Municipal Research Bureau, said yesterday that such excuses are baseless. Tyler said the number of fires has decreased by more than half in the past two decades, but that little has changed in the Fire Department. He blamed the Fire Department's high spending on the firefighters union, which he said has repeatedly blocked meaningful reform, and on mayors, including Thomas M. Menino, who he accused of giving in to union demands rather than deal with a public fight with firefighters. "They've been willing to provide generous salaries and benefits just to keep peace," Tyler said. "It just, it accumulates over time, that makes it one of the most expensive fire departments per capita in the country." Menino administration officials say they plan to make major cuts this year to the department, including eliminating eight district chief positions and eight chief's aides. The city is in arbitration with the firefighters union over changes to the union contract that city officials say would save millions more, including reductions in sick time allowances and increases in employee contributions to health insurance. But the total cost savings, expected to slice roughly $7.2 million from the department's annual budget, would not improve the city's national ranking for fire expenses - spending per resident would still ring in at $440. And Conley said the city's planned cuts come nowhere near what's needed. For example, he said, the city must eliminate an outdated division employed solely to look after fire alarm boxes across the city dating to the 1800s. The division costs taxpayers $2.5 million per year. And he said all the firefighters in the firetruck maintenance division should be replaced with licensed mechanics, who typically don't earn as much. The 12 firefighters assigned to the division earned an average of $134,000 each last year. Menino ordered the hiring of four licensed mechanics to work alongside the firefighters after a fatal firetruck crash in January was blamed on brake failure. But the mayor stopped short of replacing the firefighters with mechanics. Menino administration officials said yesterday that no final budget decisions have been made, and everything is still on the table. Menino spokeswoman Dot Joyce said the mayor's draft budget isn't due to be finalized until April 8, when he will submit it to the City Council. "The mayor continues to meet with budget staff on a daily basis," Joyce said. Globe staff reporter Stephanie Ebbert contributed to this report. Donovan Slack can be reached at dslack@globe.com.